Debras Random Rambles: Where would you survive a Zombie Apocalypse? Heres a few place! A bit of Halloween Fun! Where would you survive a Zombie Apocalypse? Heres a few place! A bit of Halloween Fun! It’s finally here. Sirens wail in the distance, cars careen into shouting pedestrians outside as you frantically fill your bag with whatever is in close reach. It’s not as if you have any sort of game plan—after all, how do you pack for a zombie apocalypse? 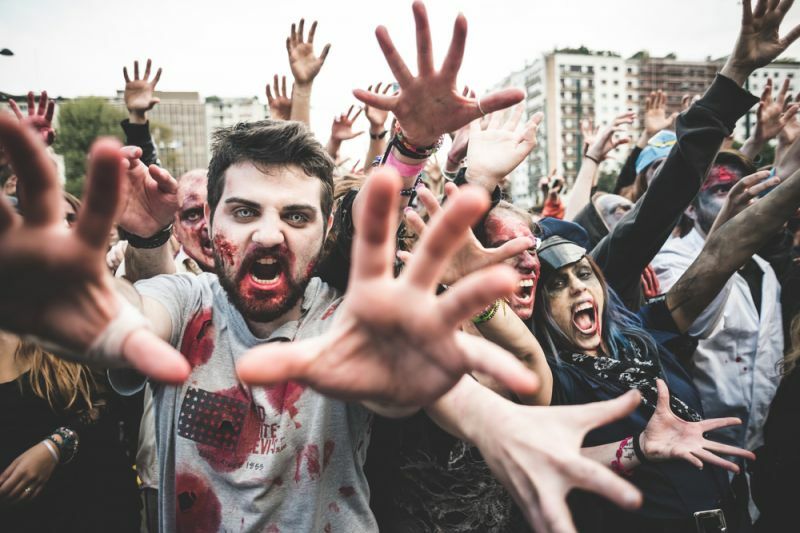 Movies, TV shows and books have all taken a stab at defining the undead zombie — how it is brought to life, its likes and dislikes, its habits, and if it likes brains rare or well done — and what uninfected humans need to do to survive. But there are many contradictions between these various depictions. In I Am Legend, zombies are clever and sensitive to light. In The Walking Dead series, zombies are attracted to noise and smell, walk in the daylight and can swim. Luckily, FindTheHome sifted through all of the noise and identified the best cities to survive the impending doom of humanity. To assess the zombie-readiness of each place, they judged each city by a combination of three factors: resources, defense, and demographics. The higher the overall score, the better equipped the region is to survive. The cities that scored highly in the resources category were those with lots of hardware stores, sources of water, grocery stores or crop farms. Your first instinct when faced with the possibility of total human destruction may be to just run, armed with whatever you may have picked up, with no particular destination in mind. But keep in mind that fighting off the undead is half the battle of surviving a zombie apocalypse—the other is making sure you have enough resources to keep yourself alive. Without a source of water, access to food (whether it’s canned or grown), and tools to create or reinforce a shelter, you might as well offer up your brains on a platter. With these metrics in mind, the Midwest, Pacific Northwest are the best places to build your zombie-proof home. If you want to make sure you can defend yourself, areas with access to guns, ammunition manufacturing and military bases are the best places to go. Luckily, areas with high concentrations of gun stores and ammunition manufacturing are scattered all throughout the country (especially in Nevada). If you weren’t a fan of the Second Amendment before, all it takes is an army of frenzied zombies to make you a convert. Finally, towns with low population density and predominantly young, educated populations were deemed fit to adapt best to such an apocalyptic event. When the zombie apocalypse finally grips the world as we know it, it will be a survival of the fittest. Any weakness could be your downfall. That’s why FindTheHome gave bonus points to places with a high percentage of educated 20- to 44-year-olds. These places include the Mid-Atlantic and West Coast regions. Fitness and the ability to think quickly on your feet comes in handy when battling flesh-eating menaces. When combining all these factors, you get the best places to further your chance of survival. So when the day finally comes to pack your bags and your rifle, you’ll know exactly where to go to have the best chance of keeping your life—and your brain.